Splendid Journey: Maggie is ready to go! Maggie is ready to go! Well, it has been awhile since our last post and I just don't know where the time has gone! But it is about to sloooww down a lot...... being out on the water with no phone, no TV, no house, and no house to look after, we find that there are actually 24 hours in the day, not 12 or 15 like we are used to. Only 5 more days to go! We are half way through provisioning the boat, but the last few days will be a real push. 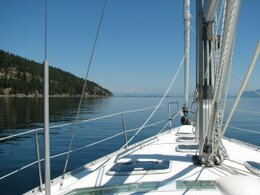 Looking forward to getting out on the water .... our journey this summer will take us around Vancouver Island.